Once again, a union blockade seems to have been deemed illegal by the police. Dagens Nyheter reports the anarchosyndicalist union, SAC Syndikalisterna, broke off a blockade against Systembolaget (the only chain of stores in Sweden allowed to sell alcohol) in Stockholm, to avoid a confrontation with the police. They were still able to have some effect though, since they stopped deliveries for at least one day. And this is just before midsummer’s Eve, one of the holidays in Sweden that entails the most alcohol. Hade you seen the film The Wicker Man (the one from 1973)? Midsummer’s Eve is kind of like that, except we don’t burn any wicker men, we just dance around a phallic pole stuck into the ground. And most(?) of us don’t even do that, we just get drunk. I intend to use this blog to share inspiration. I will talk about things that inspire me (media/culture/reality) and also talk about things I’m working on. 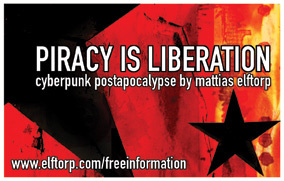 Mainly my cyberpunk postapocalyse comics project, Piracy is Liberation. Several emplyees at Försvarets RadioAnstalt (FRA) have had their personal details put up on the internet by hackers, according to Dagens Nyheter, in response to the new law. Bommi points out that the worst case of terrorism (which is ususally the justification for these things nowadays, as we all know) was performed by police and military in 1940 and was financed by the leader of one of the parties that are currently in the Swedish government. Yesterday, the Swedish government passed a law that allows them to monitor all communications crossing the Swedish border. Which means that they can hear anything we say, basically. Of course, this is nothing new. They’ve been doing this for years. I think it also says something about the Swedish society in general, that they think they can pass this kind of law without repercussions (and, even worse, that they actually do get away with it). That’s all for now. I need whisky.